If you’re looking for a great wideband air/fuel gauge, you’re probably running a performance vehicle. And if you’re running a performance vehicle you probably care about your cars. And if you care about your cars, you wouldn’t want to make a bad choice on a part that could greatly affect your vehicle’s engine, would you? Wideband gauges are not an upgrade from narrowband gauges, they just hold a different purpose. Most cars come stock with a narrowband gauge because that’s all they could ever need. However, if you’re running a more powerful, performance engine, chance are that you’ll be running air to fuel ratios that just can’t be recognized or maintained by a narrowband sensor. Is it important to get the right AFR? Hell yes! 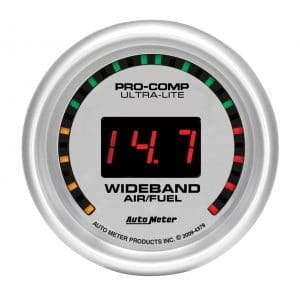 Wideband gauges essentially are a helper-tool in tuning your engine. In the process of an engine tune-up, it’s vital to have accurate and timely air to fuel ratio information because bad ratios could permanently damage your car. Running too rich of an AFR (too much fuel, not enough air) can cause you to lose power to your engine, and running too lean of an AFR (too much oxygen, not enough fuel) can seriously blow your engine. 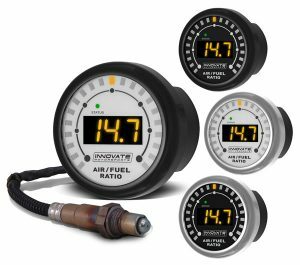 What matters when looking for a good wideband fuel gage? Well, since the most important thing they do is measure you air to fuel ratio, the most important thing you can look for is good response time. If there are delays in the data they put out, your ECU could end up compensating for the wrong ratio at the wrong time. It’s also important to look for easy-to-read displays, as you will want to be able quickly see what you’re running. 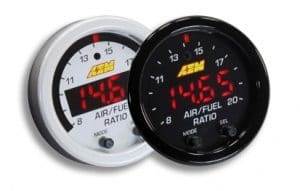 Here’s a rundown of 5 of the top wideband gauges on the market right now including their best benefits and important things to consider when looking to buy. 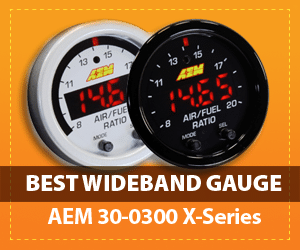 AEM’s 30-300 X-Series Wideband Gauge earns the title “Best All-Around Gauge on this list for several reasons. First off, like several others on the list, it runs the Bosch 4.9 LSU Sensor. Second, the display is large and clear and auto-dims itself. Third, the gauge is 52mm, meaning it will fit relatively any vehicle well. One major benefit to this gauge is that it operates with X-Digital technology. X-Digital allows this gauge to have the fastest response time of 18 gauges (discovered in an independent study against 17 competitors’ products). It has a large ratio reading ability of anything from 8:1 through 20:1 and can measure AFRs in hundredths. The calibration of the resistor from factory settings does not need free-calibration, but the user does still have the choice if they prefer to calibrate for themselves. Keep in mind that this gauge’s cup is only .200 inches in depth. This shouldn’t be a problem for most, and can actually be a benefit. However, it may be hindering depending on your ideal placement for your vehicle. This gauge absolutely deserves a recommendation. I has wonderful technology, a very clean and simple display, the ability to report AFRs between 8:1 and 20:1, and is easy to install. Though it is a little more expensive, you’re paying for top-of-the-line X-Digital technology, which means more accurate engine data. 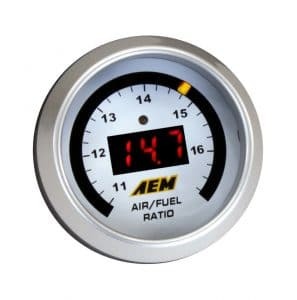 This gauge from AEM runs a LED display with easily read rich to lean indicators. It comes with interchangeable color layers (between silver and black) for your own personalization. The appearance of the gauge isn’t too modern or too vintage looking. It’s a good neutral look for most any vehicle. One great feature of this gauge is that it NEVER requires free-air calibration. The factory calibration is so reliable, that AEM guarantees you should never need to mess with it. The reviews for this product are a testament to their claim. This gauge sends back very timely data on your AFR’s, even in response to a .1 change in your ratios. The Bosch 4.9 LSU sensor allows this to happen while drawing a very minimal power current. The sensor is a standard fit at 52mm. One thing to be cautious of when considering this gauge is the fact that it only measures ratios of 10:1 through ratios of 20:1. This may be an issue if you’re going to run lower than 10:1 at any point in time and need a sensor that will gauge it. Also, the bung in this gauge set is only half an inch, which will cause the gauge to sit very close to the exhaust stream. This may or may not be an issue, depending on your personal setup. This gauge definitely deserves a recommendation because of what you get for the money. A gauge that never requires re-calibration and reads a range of 10:1 to 20:1 is a great deal. Also, it’s a reliable product according to its reviews on Amazon, and is easy to install. Absolutely a solid choice for a wideband gauge. This gauge from Innovative Motorsports is sleek and clean as they come. It has a blackout, minimal appearance with nothing but the essential numbers in a striking green, blue, or red (buyer’s choice) on the LED monitor. As a market standard, it runs the Bosch 4.9 LSU sensors, meaning it can gage quickly without pulling too much power. It’s a 52mm gauge and so is pretty universal when it comes to what vehicles it will fit. This gauge also includes an O2 sensor. Something to consider when thinking about this gauge set is that the instructions for installation could be a little difficult to follow. Not a big deal if you know what you’re doing. One really handy feature of this gauge is that it allows you to log your data directly from a digital output into your laptop. Plus, it includes all the necessary software needed to do so. This gauge is not a bad choice at all and definitely gets a recommendation. It’s crisp and clean and definitely looks like a nice addition to the aesthetic of any performance vehicle. It’s higher on the price scale, but still not too bad considering it comes with an O2 sensor included in the price. Great look, plus great technology, plus included O2 sensor equals a great option. The gauge from Auto Meter is the most expensive on the list, however, it does come with an O2 sensor. It also comes with a one year limited warranty from the company itself. This gauge has a bright, clear display and is available in five different sizes. The user also has the ability to utilize laptop tuning with this AF gauge. One thing to keep in mind when considering this gauge for your vehicle is that it performs a fifteen-second countdown from the time you start it up. This could potentially cause issues if you needed immediate data from the moment you turn your gauge on. Also, this gauge’s installation instructions have been found to be a little difficult to follow. This gauge may not be the best choice. The fifteen second startup could lead to false or untimely data (which could lead to major car/engine issues), it’s quite expensive (even though it does include an O2 sensor). 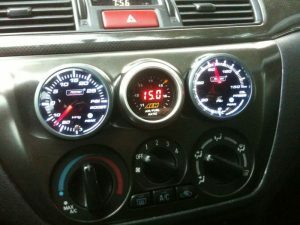 When it comes to wideband gauges, you definitely have better options. This gauge has a LED display that is easy to read and recognize at a glance. Like the first one, it runs a Bosch 4.9 LSU sensor making it practical and accurate. At 52mm, it will fit virtually any vehicle’s exhaust system easily. It reads anything from 7.35:1 through 22.4:1 AFR. One benefit to this gauge is that it adjusts independently to changes in temperature, altitude, and even sensor condition. This could be helpful for you if you plan to ride long, cross-country distances in your performance vehicle. Also, this sensor has the ability to be calibrated with an O2 sensor if you desire. One thing to watch out for with this AF gauge is that it could potentially need more regular removal for cleaning than some others. It may require that you clean it every few months for it to continue reading properly and quickly. Also, the look of this gauge may be a little less crisp and clean as some of the others on the list as it has a sort of dirty yellow display. However, you can choose between a white display or a black one to tailor it more to the look you desire. One other thing to be aware of when considering this gauge is that it comes with a serial cable for calibration. There’s nothing wrong with calibrating with a serial cable, it’s just a pretty old method that requires a little more attention and time. However, Innovative Motorsports does offer a separate cable adapter if you really don’t want to deal with the serial cable, but it would need to be ordered separately and would cost more money. If you are looking for something to do the job of an A/F gauge for just a few months, this gauge is an okay choice. However, quite a few reviews on buy sites have mentioned the inevitable malfunction and misreadings after a few months. However, it is the cheapest, and perhaps that’s why. Wideband oxygen gauges show data about how much air versus how much fuel your car is putting out in its exhaust. The information comes from an O2 sensor which sit above a car’s exhaust and take measurements of the ratio of fuel vapor to oxygen coming out of the exhaust. These ratios are measured in “air:fuel” readings. For example: if there’s one part fuel to 15 parts O2, the reading will be 15:0. Every vehicle has A/F sensors, but most cars come stock with a narrow band gauge. What Does a Wideband Air/Fuel Gauge Do? The difference between a narrow band and a wide band gauge is the range of ratios they are capable of reading. A narrow band can only read from about 14.5:0 through 15:0, but a wide band sensor can read from as low as 5:1 all the way through 22:1. 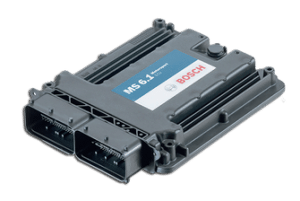 Your car’s ECU (Engine Control Unit) communicates with the A/F sensors to try to maintain a reading of 14.7:1, which is the most effective measurement to emit less but optimize fuel efficiency and lengthen the life of your engine. A wide band gauge is commonly mistaken as an upgrade from a narrow band. However, it’s actually just a tool to facilitate an engine tune up and maintain a “richer” A/F mixture in performance cars. Performance engines have optimal measurements of around 13:1, which cannot be read by a narrow band gauge. All cars are always monitoring the air to fuel ratios, even stock narrowband sensors constantly receive and send info to your car’s ECU. 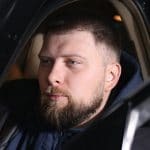 However, in a vehicle that isn’t performance, you generally don’t have to worry about running lean or rich to the point where your car can’t compensate for itself. It’s when you make the switch to a performance engine that you will need to invest in a gauge that will display this information that already happens in your car so that you will be able to notice if you’re running too lean. Being able to glance at this data on a gauge gives you the ability to shut your engine off if it’s running too lean before you damage it for good. You can put a wideband O2 sensor on your vehicle without installing a gauge, but that’s almost counter-intuitive. The reason behind a wideband O2 sensor is to be able to tune your engine, tuning your engine requires you to see what AFRs you are running. A gauge makes that data easily and constantly available. There are several things to consider when looking for the perfect AF gauge for your performance car. One important one is knowing what ratios your gauge will need to be able to recognize. For example, If you’re going to run lower than 10:1, you shouldn’t buy the AEM (30-4110) UEGO because it won’t be able to read it. Another component to keep in mind is appearance. The gauge will be something you have to look at regularly, so it’s probably important that you like the way it looks. Looks of the gauges on this list range heavily. Be sure to look into all the colors available and if there are interchangable colors. Also, be sure to click the color you want if ordering online. You should also consider whether or not you will need a new O2 sensor. Some gauges come in a package with the sensor. However, the gauges themselves (the items on this list) are simply displays of the information your O2 sensor is giving out. So, you will need to know if the gauge is compatible or if it needs to be paired with a sensor in the same line of production. Some gauges are relatively universal, so they may not require you to get a new O2 sensor. However, it’s best to do your homework. Shopping around for the best Wideband Gauge can be a little tedious. 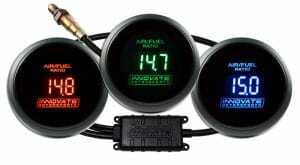 Several websites offer multiple gauges, and even multiple choices and prices for the same gauge. However, picking a product from this list can definitely rid you of some of the stress of searching through the depths of the internet. The products on this list are five of the top in the market, and range in the features they have to offer. Key features are the biggest thing to be able to identify when looking to purchasing anything at all. The appearance, price, ratio reading ability, easiness of installation, inclusion (or non-inclusion) of an O2 sensor, reliability, credibility, and technology type are all important factors to look into when considering Wideband gauges. Only the best products offer most of these in one. “At 52mm, it will fit virtually any vehicle’s exhaust system easily” really? come on what does the size of the gauge face have anything to do with what exhaust it will fit? Also some reviews such as the AutoMeter state that its the most expensive gauge because it comes with an o2 sensor? This argument in invalid since all of these gauges include a sensor with them. Also in the AutoMeter review you state a Con that it has a 15 second count down until it starts reading. All of these gauge systems mentioned here have the same count down while the sensor warms up. Even the OEM o2 sensors in every car ever built being wideband or not have a period of time to warm up before they start reading. Oxygen sensors relay on a chemical reaction between the burned oxygen and the sensor elements to produce a reading and this chemical reaction requires heat. Why they don’t mention the Innovate PSB-1 #3892, boost and AFR gauge all in one ? Can you add what Bosch part numbers are being used? Wondering if it a sensor or gauge thing.